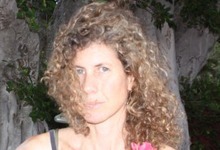 Laura began animating in 1988 as a means to combine her love of dance and art. Animation has continued to inspire Laura, who has spent over twenty five years exploring paint in motion. Her personal films have been screened worldwide in film festivals (Sundance, Ann Arbor, Margaret Mead, Anima Munde, Asifa, New York Children's Film Festival, and Cardiff International Film Festival, Hawaii International Film Festival, Honolulu Museum of Art, etc) and her commissioned work has aired nationwide (PBS, CBS, MTV, VH1, Sundance Channel etc.). She has received awards and grants from Cinedance Film Festival, Broadcast Design, Asifa East, Ann Arbor, and Creativity Magazine, New York University, the New York Foundation for the Arts, Dance Films Association, The PEW Charitable Funds. Besides creating her own films, Laura has worked as a designer and colorist at MTV Animation on the classics "The Head", "Beavis and Butthead" and "Daria" and as a freelance illustrator, animator and artist. Laura has taught animation at Pratt, New York Film Academy, School of Visual Arts, Punahou School, I'olani School, Hawaii Women in Filmmaking and at New York University's Tisch School of the Arts where she was on the faculty and taught for thirteen years. She has been teaching animation at the Academy of Creative Media at the University of Hawaii since 2015. She continues to work on freelance jobs. Most recently she supervised the animation as well as creating animation for a collaborative event Symphony of Birds at Blaisdell Cancert Hall in Honolulu.